Mayor Kevin Faulconer officially opened the first of three bridge shelters for homeless individuals that he described as “best in class” accommodations. The shelter at 16th Street and Newton Avenue will serve 350 single adults. It has bathrooms, showers, 24-hour security and Wifi. It’s managed by the nonprofit Alpha Project, and will have case workers and health professionals on duty. Residents began moving into the shelter Friday afternoon, and Bob McElroy, president and CEO of the Alpha Project, said it would be full by the middle of next week. The city is erecting two more shelters, one for 150 beds for families at 14th and Commercial streets, and one for 250 veterans on Sports Arena Boulevard in the Midway District. The goal of the shelters is to provide temporary housing for up to 120 days while residents search for permanent lodging. “People without shelter who are sleeping on sidewalks, in canyons and along the riverbed need our help now. While we work to create more housing opportunities, these temporary bridge shelters will provide a safe and clean place for people to go,” said Faulconer. 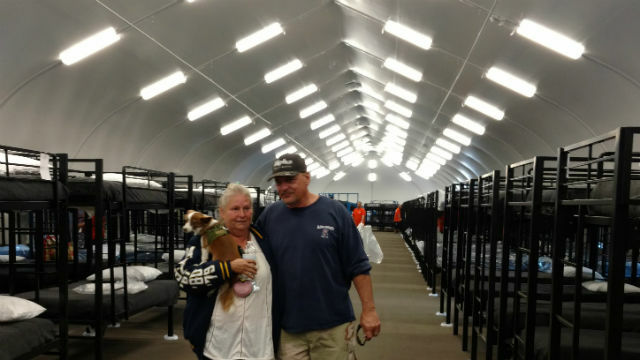 Councilman Chris Ward, who chairs the City Council’s select committee on homelessness, noted that the shelters are new, clean and comfortable — and a big improvement over the winter tents the city previously erected. “We’re going to continue to build on the work begun here,” he said, calling it a “milestone” in ending homelessness. The homeless population in the city of San Diego has been growing in recent years. In January, 5,619 transients were counted, a 10 percent increase from last year. Of those 3,231 were living on the street.